The biggest weather story for the Easter Weekend will be strong winds, especially from Saturday evening into early Sunday morning. An area of low pressure centered near Minneapolis, Minnesota early Saturday morning will race east-northeast through the Great Lakes and into southeastern Canada. 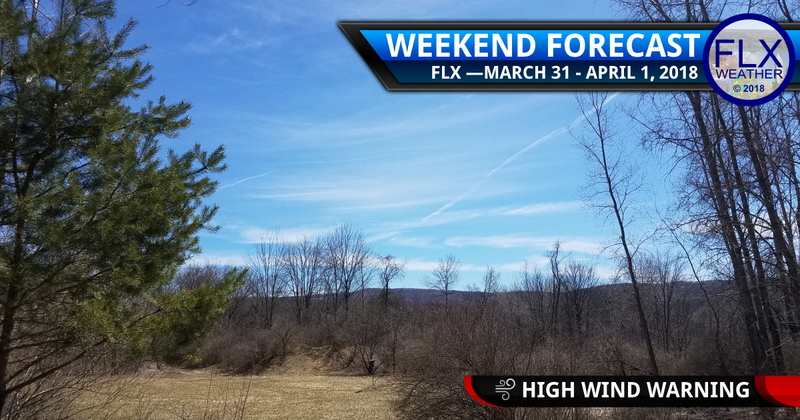 Out ahead of this low, skies are starting Saturday clear and sunny. The bright sunshine will help temperatures warm nicely, aided by the gradually increasing south wind. High temperatures today should climb into at least the low 50s with a few mid 50s also possible. Clouds will start to increase during the afternoon as the storm system approaches. Winds will increase this afternoon as well with gusts to 30 mph by dinner time. The wind will continue to increase into the evening hours, especially along the shore of Lake Ontario and over the western Finger Lakes. Here, gusts could approach 45 mph or even higher. High Wind Warnings and Wind Advisories have thus been issued for portions of the Finger Lakes. Check out the Weather Alerts page to see if your county is under an alert. Rain showers should move into the region shortly after sunset and will persist into the early overnight hours. Rain amounts will be minimal with most areas remaining well under a quarter-inch. Once the cold front powers through, the precipitation will mostly end and winds will swing around to the northwest. The influx of cold air Saturday night will send temperatures into the 20s for early Sunday morning. Blustery winds will continue with widespread gusts of 35-40 mph. This will produce wind chills in the teens and low 20s at sunrise. A stray flurry may also be possible, but clouds should begin to break up during the morning hours. By the afternoon, skies should be more sunny than not. High temperatures on Sunday will push into the upper 30s with a few of the typically warmer areas reaching 40 degrees. However, with the continued gusty winds, it will feel more like the upper 20s or low 30s. The wind will significantly decrease Sunday evening and will swing back towards the south overnight. This, along with a new batch of clouds, should keep temperatures in the upper 20s Sunday night. Monday then looks to turn sunny once again with highs pushing into the mid and upper 40s.